Kumpulan Contoh Soal Bahasa Inggris tentang Letter dan Pembahasannya – Sobat englishiana.com, pada posting kali ini kita akan membahas berbagai contoh soal yang berhubungan dengan letter dalam bahasa Inggris. 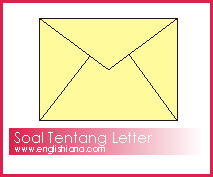 Soal bahasa Inggris letter ini memliputi berbagai jenis surat baik formal letter (surat resmi) maupun informal letter (surat tak resmi). Perhatikan langsug contoh-contoh soal berikut! Hello Paula, how are you? It's been a month since l last heard from you. Well l just wanted to tell you that I was in a hospital last week. According to the doctor l was infected by dengue fever. At the hospital, I was brought into the emergency unit. The doctor immediately gave some treatments. Finally, l had to stay there for one week. Everyday the doctor kept me on a drip. At the seventh day, my condition was getting better. After the final check, the doctor gave me permission to go home. Now, I'm okay and because of my illness, I am now more careful about keeping in my house clean especially my room, I don't want to get the same illness again. OK, think that's all from me, write to me soon ok? 1. What is the topic of the letter above? 2. What did the writer do when she felt her body became weak? 3. What was the disease that she got? 4. Why the writer was taken to the hospital? 5. How long she was taken care in the hospital? 6. What does the letter tell us about? 7. Why is Fahri worried that he may fail the national examination? 10. What is the topic of the letter above? 11. What did the writer do when she felt her body became weak? 12. What was the disease that she got? 13. Why the writer was taken to the hospital? 14. How long she was taken care in the hospital? Indah, sorry I haven’t written to you for so long. We moved into a new apartment last month and we’ve been really busy getting settled. The apartment is on a quiet street in a good neighborhood. There’s also a shopping center just down the street with a supermarket, some quite good restaurants and some stores. 15. What is the letter about? 16. Why hasn’t Shelly written a letter to Indah for so long? I read the Kabari Post dated March 19, which stated that your company needs a finance manager. I graduated from a reputable university in Jakarta and was awarded a bachelor's degree by the Economics Faculty. I believe that my educational background is suitable for the position. I am hard-working and will always be responsible for my job. Since l graduated from university, I have had many work experiences, from general staff to finance manager. Recently, I have worked for three years as a finance manager in a construction company in Jakarta. However, I have to move here due to my marriage. I have enclosed my curriculum vitae and l would welcome an interview with you. l'm ready to be interviewed anytime. Thank you for your consideration. 1. How did Salma know about the job vacancy? A. By browsing the Internet. B. Someone told her about it. C. By reading a magazine. 2. Why does Salma move to Batam? A. She intends to have more experiences. B. She follows her husband. C. She follows her parents. D. She intends to have a higher position. E. She intends to work in a big company. I am writing this application for the senior customer service agent position as advertised on the official website of Eagle Airways. As required, I am attaching my resume and copy of highest educational certificate. 4. l provide exceptional contributions to customer service for all customers. Possessing a diploma in communications at Queen's University, I have excellent skills in dealing with people from different backgrounds. I also have experience in using new technology devices. Please refer to my resume for further information on my abilities. I can be contracted anytime via e-mail at Lawson evan@email.com or my cell phone, +61 87638 927492. 3. Where is the vacancy advertised? 4. Where did the applicant graduate? 5. What company did the applicant work for before? I am writing to apply for the post of Digital Printing Machine operator, which was advertised on the Berita Kita newspaper on December 26, 2015. My working experience at Global panca media improved my skill in operating a digital printing machine, communication skills and ability to work in a team. I'm a fast learner, creative and have a good conduct. Besides, l can adapt to new environment very quickly and work under pressure. In addition, I was chosen best Employee of the year 2014. Working for PT Lantern Abadi as a multinational company appeals to me Because It has a good reputation and it provides excellent training. Your organization produces high- quality products and l can contribute to this with my skills. I am available for interview at any time. I can be contracted on the mobile phone number given above. I look forward to meeting you. 6. What job is vacant? B. Digital printing machine mechanic. C. Digital printing machine operator. 8. What was Guruh Hartajaya best achievement? I would like to (9)______ whether you have any vacancies in your company. I enclose my resume for your information. I graduated from SMK Pemuda Bangsa in 2013 majoring in Marketing. I have work experience in the (10)______ and industrial sector which has developed my skills and ability to work in many different environments. I believe that my skills and knowledge will (11)______ your team. I can operate a computer and have a charming personality. I would be grateful if you would keep my resume on file for any future possibilities. Nah, demikianlah contoh-contoh soal yang berkaitan dengan letter / surat dalam bahasa Inggris. Semoga pembahasan ini dapat memperdalam pengetahuan kita terkait dengan letter dalam bahasa Inggris. Untuk melihat soal-soal dengan topik yang lainnya, silahkan klik disini.